Cheap 1-month filters protect your heating & cooling system from debris, but they don't remove a single speck of dust from the air. 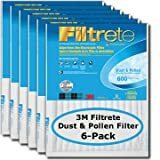 Step up to the Filtrete Dust & Pollen Filter and turn your heating & cooling system into a huge whole house air filter - removing allergens like Pollen, Mold Spores, Dust Mite Debris, Household Dust, and Lint. Like all 3M Filtrete filters, the Dust & Pollen filter lasts for 3 months, and is electrostatically charged, which helps it to attract even the smallest particles without restricting the airflow in your system.